Are you looking for the best alternative to OverPlay Smart DNS service, for unblocking geolocation restrictions to your favorite TV & video streaming services? Here are alternatives, and sites like OverPlay with pros/cons on each! Nowadays, there are quite a few existing Smart DNS plus VPN providers, but in my opinion, based on my experience only a handful are really good. And while OverPlay is one of the better ones, they have down sides, pricing could be cheaper, and there are streaming sites that are not supported. Here are the three best OverPlay alternatives, that I consider well worth the time to consider when planning a Smart DNS for unblocking sites. This is a very popular Smart DNS service, and no wonder, when you look at their pricing which is a huge save in cost, compared with OverPlay. But they also have excellent tech support, and passing geolocation restrictions is a breeze on a big collection of supported video streaming sites. Again, cheaper than OverPlay (even with a VPN included) and what I most like about them is that they have an easy-to-use Smart DNS connection client. Yes. No need to configure, and edit your DNS settings. You can flip the service on and off, and change country regions straight from their software. And as far as I know, SmartyDNS is the only provider that has this feature. Good for them! While these guys are the same price as OverPlay, you can find quite a few channels that are supported here that are not supported elsewhere. Definitely worth checking them out to see if your site is supported. And that’s my list of the best three alternative Smart DNS providers, that I know and can really recommend as a reliable service. Know any other sites like OverPlay worth attention? Suggestions and comments are welcome below! Thanks! 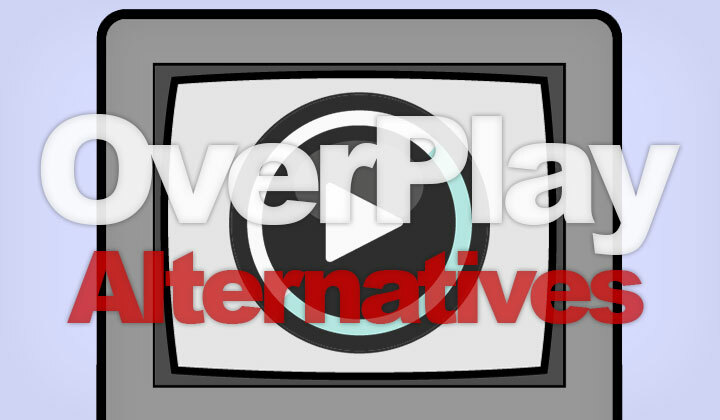 Oh and below I’ve listed some of the channels that you can unblock with the above mentioned OverPlay.net alternatives. Good luck! TVNZ, FOX Soccer2GO, 9Now, TV4 Play, NFL GameRewind, ESPN, AnimeLab, FX Networks NOW, Funimation, Fox Sports, FOX NOW, MAX GO, ZDF, TV3 Ireland, Bloomberg TV, FOXTEL, Alarabiya, Alleskino, TV2, ABC iView, Sundance Now, CUATRO, CNBC, MediaSet, sport1, Animal Planet, Aftonbladet, Pandora, Yomvi Plus, Crunchyroll, MSNBC, Ulive, Comedy Network, 4Music, Eurosport ES, Blinkbox, Willow TV, TNT Drama, EuroSports Player UK, Asian Crush, Blockbuster On Demand, BBC Radio, Golf Channel, Last.fm, CWTV, beIN CONNECT ES, Sony Music Unlimited, Tennis Channel, Viki, The Daily Show, Animal Planet GO, Nickelodeon, CBS, History, ESPN UK, Molotov TV, Oprah, VOOT, Planet Rock, iBox Live, SwagBucks, NBC Sports Live Extra, RTS, Stofa, TLC GO, A&E TV, Viaplay NO, Travel Channel, Bravo, UKTV Play, Global TV, TV4 Play, TV Catchup, TV Spielfilm, HGTV, SkyGO NZ, ABC, FranceTV Sport, Zuus, ZDF TiVi, RTR, Wilmaa, Showtime Anytime, Tata Sky, Videoload, cwseed, SimpleStream, RTLnow, PBS Kids, Disney Life, HBO Nordic, ServusTV, LightBox, MySqueezeBox, BYUtv, Mubi, Watchever, Teleboy, Channel 5 Demand5, Tentkotta, Rdio, NCAA, Cinema Now, Dplay, Simpsons World, Telecinco, NHL GameCenter, FOX Sports, MagineTV, Yahoo Screen, beIN Sports Connect, RAI, Turkcell TV, Animax Plus, Canal Plus, Total Channel, US Open, 3sat, CBC, Big Bash, 3DGO, Ard Mediathek, Wuaki TV, TV3 Play, V8 Super Cars, Sky Go, Warner Bros. Television, South Park Studios, HBO NOW, DIY Network, Crackle, ESPN GO US, Sky Go Germany, Tidal, BBC Sport, Star Sports, Netflix, MLB, BeIN Sports AU, National Lottery, Ondemand Korea, Comedy Central, Smithsonian Channel, Atres Player, FandangoNOW, Zattoo, BeIN Sports Connect, WatchAFL, TVPlayer, FOX News, MLS Soccer, Viaplay DK, HGTV, Science Channel GO, Canal Digital, Tvyo, Livestream, Sports Canada TV, Shomi, Channel4, Logo TV, SportsNet, Investigation Discovery GO, SiriusXM, MHz CHOICE, TF1, TV10 Play, BT Sports, AbsoluteRadio, AOL On, Cooking Channel, Fox, SBS, ProSieben, DMAX, FoodNetwork, TVA Nouvelles, AFL AU, Mitele, Hulu, Turntable, Sveriges Radio, Cricket Gateway, Zee Family, TV6, MGO, 6play, YouSee, Spike, NFL Now, MyCanal, OSN, RSI, xFinity, TV8 Play, Bet, YuppTV, Amazon Prime, Itv, SVT Play, SRF, PLUTO TV, NPO, TVNOW, Swiss INFO, Epix HD, BluTV, WWE Network, BBC iPlayer, PopcornFlix, The Loop, Maxdome, rTVe, D-Smart Blu, FX Networks, ZeeTV, MSG GO, Radio.com, MTV, SHOWCASE Canada, Viaplay SE, TV3 SPORT, STV Flow, VH1, Starz, PGA, Showtime, Canal Play, DittoTV, Professional Darts Corporation, Arte TV OnDemand, Drama Fever, SyFy HD, Sling, Now TV, MBC, HBO GO, FOX SPORTS GO, SONY LIV, AMC (amctv.com), PBS, 6Play, Lifetime, Tastemade, NFL Game Pass, Horizon GO, DR, Eonline, EuroSports Player France, Beats Music, Spotify, France TV 1,2,3,4,5 & Pluzz, Fandor, Premier League Pass, Oxygen, Amazon Prime Germany, Disney Channel, DPlay Kanal 5, Einthusan, Shudder, History Canada, TNT Dallas, TV Land, Disney XD, Vudu, NBA, Sprout Now, UFC, Stan AU, National Geographic Channel, NBC, Digiturk Play, 4oD, USA NOW AppleTV, Gulli Repay, TBS, Masters, Funimation NOW, CNN GO & iHeart Radio (280 in total). Some of the “alternative guides” and other posts on Elftronix.com contain affiliate links. This has been done in a way that is meant to better the quality of such content, and supports both current and future work put into the blog. Your support is hugely appreciated, as well as voluntary. Many thanks & best regards, David.